The Store-only version of Windows becomes an installation option instead. With the next big update to Windows 10, version 1803, Microsoft is making some big changes to how it sells the software to OEMs. The biggest casualty? Windows 10 S—the restricted version of Windows that can only run apps from the Store—is going away. Currently, Windows 10 S is a unique edition of Windows 10. It's based on Windows 10 Pro; Windows 10 Pro has various facilities that enable system administrators to restrict which software can be run, and Windows 10 S is essentially a preconfigured version of those facilities. In addition to locking out arbitrary downloaded programs, it also prevents the use of certain built-in Windows features such as the command-line, PowerShell, and Windows Subsystem for Linux. For those who can't abide by the constraints that S imposes, you can upgrade 10 S to the full 10 Pro. This upgrade is a one-shot deal: there's no way of re-enabling the S limitations after upgrading to Pro. It's also a paid upgrade: while Microsoft offered it as a free upgrade for a limited time for its Surface Laptop, the regular price is $49. When announcing Windows 10 S, Microsoft expressed the hope that other premium devices would ship with the version. This doesn't appear to have happened; aside from Surface Laptop, the other Windows 10 S devices are all low-end, aimed at education markets. Among these, Microsoft's figures say that some 60 percent remain on Windows 10 S. Of those who switch, 60 percent do so within 24 hours, but of those who keep Windows 10 S for a week, 83 percent never upgrade to Pro. Brad Sams of Thurrott.com writes that, for Windows 10 version 1803 (codenamed "Redstone 4"), this is changing. According to leaked documents provided to Microsoft's partners, with version 1803, Windows 10 S will be a mode of Windows 10 Home, Windows 10 Education, and Windows 10 Pro, rather than a distinct version. Switching Windows 10 Home S and Windows 10 Education S to regular Windows 10 Home and Windows 10 Education will be free; switching from Pro S to Pro will continue to cost $49. Redstone 4 is also bringing a new system of OEM pricing that will tie what OEMs pay to the hardware specs of the system they're selling. This isn't the first time Microsoft has done this, but the new scheme appears to be finer grained, with five different tiers: Entry, Value, Core, Core+, and Advanced. 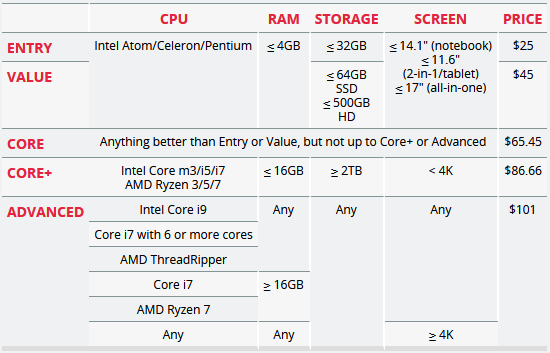 These prices and hardware configurations apply to the Home edition; Pro and Pro for Workstations have their own pricing schemes. This repositioning of S as a mode rather than a version makes sense. How the details will work in practice, however, is not immediately clear. Current Windows 10 Pro can't revert to Windows 10 S without a full reinstall. This means that there's no ability to, for example, switch to the unlocked operating system to troubleshoot or perform one-off driver installation and then revert to the safer, locked down mode for normal operation. This makes 10 S much less appealing than it might otherwise be for, say, kids' PCs. The leaked documents also say that S mode will be opened up to certain anti-virus and security apps. Again, it's not clear quite what this means: the value of 10 S is that it prevents access to arbitrary programs. Anti-virus and security software is typically highly invasive, requiring not just administrative privileges but also custom kernel-mode drivers. Allowing such programs to be installed on 10 S undermines the very protections that the mode is supposed to offer.